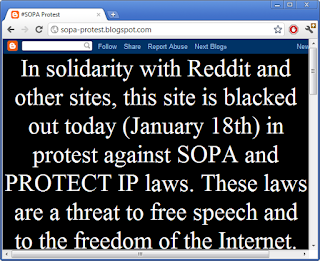 Reddit has decided to blackout their site on January 18 in protest against SOPA and PROTECT IP. This blog will, too. This blog is hosted on blogspot.com, so I can't pull the plug on it. What I can do instead is simply change the template so that the the background is black and the foreground is also black. 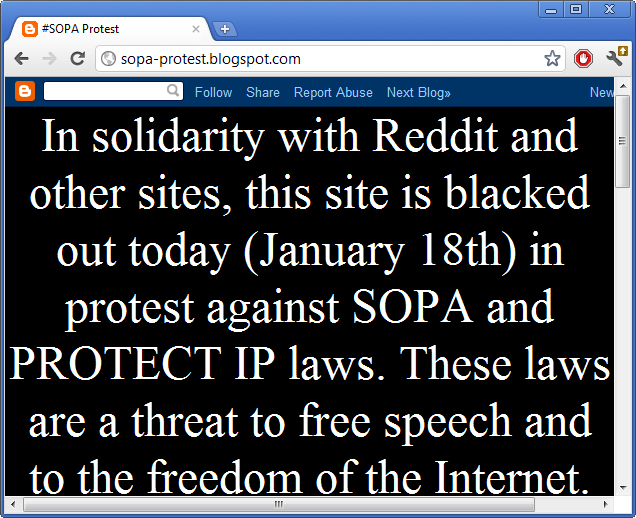 I've done this for the demonstration site http://sopa-protest.blogspot.com. You can see that all the articles, such as this one and this one, have the same template, and thus have the same blackout effect, so I don't need to edit the articles individually to cause the blackout. After January 18th, I'll simply change the template back again. SAVE the original template first!!! Change the template ("Edit HTML") so that the text is black-on-black, so nobody can read it. Add the protest message to the template, such after the <body> tag. Save the new template at 8am on January 18, 2012. Restore your old, saved template at 8pm January 18, 2012. This November, send donations to the competitors of those politician who voted for SOPA. (Of course, only a couple thousand people will notice the difference on our blog, most of whom oppose SOPA anyway, but the symbolic gesture is still important). Update: Here is a list of other websites blacking out on Jan 18. Update: Here is a great link http://www.techdirt.com/articles/20120111/09293817377/as-sopapipa-becomes-toxic-frantic-congress-test-runs-dropping-dns-blocking-provisions.shtml that discusses how the problems with SOPA aren't simply with the well-known "DNS blocking" issue. It's a wide range of issues that gives too much power to copyright holders, and forces websites to block content because of liability risk. Update: BTW, it's interesting how Reddit has become the new center of geekdom. Even though this blog has been Slashdotted a few times, far more traffic has come from Reddit. I wonder if Slashdot plans to similarly blackout their site in protest. Do the RSS feed, too! There's a countdown to the Blackout here. http://vrsry.com/sopa Thought ya'll'd like it. I made a deluxe template. I hope you don't mind that I borrowed some text from your idea. It preserves all of your widgets, tucks them at the bottom, and hides them from view. Cool. I'll copy yours on Wednesday. SO if i do copy the template and then replace it for this new one. When i re-post my old template will i have my blog as it was before, followers, comments etc? Is there any way that i can lose my blog via this? Thank you :) i'm really new to this things hehe. My Blog has about 650 views a day and almost 100 followers. hey, there i get an xml error message and i don't know why. it says: "The entity name must immediately follow the '&' in the entity reference." Save your template first, then make changes. You can restore your blog exactly as it was before by using the saved template.